Regal China Japan - Pottery Mark Query:- I have a set of China from when I was a young girl of about 11/12 (i'm 52 now) and we moved from state to state with my dad's job and instead of hauling our home with us we went to local estate auctions/reg.auctions to buy our home needs and my mother bought a set of China from an estate sale in Middletown Ohio around 1968/70 and it's incomplete as well as a few pieces are chipped. I've searched for info about the set but can't find anything about it nor what type of flower the plate has on it nor does anyone I know who's into flowers and gardening have been able to tell me what kind of flower it is. 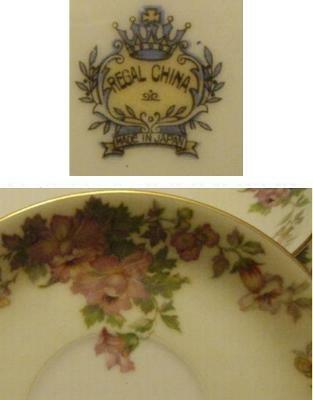 The mark on the back of the plate says Regal china and in the banner it says made in Japan. If you could tell me anything about this set I'd really appreciate it. Nice story about how you got your wares. Human stories like this are of great interest to the site. I included the photos you sent in on your behalf as a thank you for your contribution and great childhood story. However, I will tell you what I found out during my research. The “Regal“ pottery mark is only listed in my books as a ‘brand’ of both the Hull Pottery Co of Crooksville Ohio, USA and the Globe Pottery (GPCo) of East Liverpool, Ohio, USA. I don’t know if these two firms were linked in ownership at any time, but it seems likely. However, reading further references, “Regal China” is reported to be a Japanese maker used as an outsourcing manufacturer by the Hull Pottery, particularly the popular Red Riding Hood cookie jar, patented in 1943 and designed by Louise Bauer. Hull Pottery is reported to have kept it a secret they were outsourcing to a Japanese maker. I can’t find any further information about Regal China, or whether they were in fact a small maker in their own right or a branch of a bigger concern like Noritake. The ‘occupied Japan period’ was a development of the post-war rebuilding period in 1940’s to 1950’s. These slightly overdone marks, with rich pastel coloured pottery marks generally date to this period immediately following WW11. Anyone needing valuations only, please go to this vintage and antique china values page. You can also take the opportunity to liaise with experts on that page who are able to value items from the style, quality, country of origin and time period etc etc, without having to pin down the exact maker. My set has the same image but does not say Made in Japan, just Regal China Japan. It is a light subtle yellow background with gold trim, a greyish blue trim with tiny triangles and little flowers with 5 other 1.5 inche boquet of flowers on the plate. I want to find out more about it. At first look at your lovely pattern, my guess is that a wild rose. I too have a set of Regal China. Mine is called REG25. I googled and found it on a replacement website, but i didnt get too much information about it. I would love to find out more. It is in extremely good condition. I found my set when i was going thru an old barn. I came upon two cardboard boxes, which appeared to have gone thru some type of flood. It was apparent when i opened the boxes and they where full of mud and matted newspaper which was used to wrap the china. It was very hard to clean but after alot of soaking i was able to. My husband isn't sure where it came from, but it had obviously spent along time in the barn. The set takes pride and place in my china cabinet, where i get alot of comments. Nice contribution. It always amazes me how china is so delicate yet can survive shipwrecks and the ravages of time so well. Your china has a story to tell and we have uncovered a part of it at least. I am interested in the connection between Regal China of Japan and the US makers Hull Pottery from East Liverpool. Did they get things contracted out to Noritake or another big Japanese maker and call it Regal China? Or was this Regal China a separate concern altogether? Perhaps someone who used to work for them in the 1950's and 60's remembers? I inherited a 12-place setting of Regal China (Japan) from my aunt who had inherited it from her aunt. It is the same exact pattern as shown in the photo. I am missing a lid to a covered casserole or serving bowl. I am thinking this might be even older than WWII era due to when my great aunt was married and set up housekeeping. I searched for this pattern on Replacements.com and couldn't find it (they were missing photos for some of the patterns). If anyone knows of the name or number of this style, I would like to find out. The fancy colourful marks shown in the top photo are pretty well documented by specialist Japanese mark sites like Gotheborg.com to be specifically from the post-war era. So it would be interesting to have you list some dates that your Aunt was setting up house and see if these relate. For example, I am in my 50's and my aunts and uncles were young adults in the 1950's & 60's, but just kids in the period before the war - so not setting up house yet. My other passed away ad left us a 60 piece set of regal china, but not the pattern pictured on this site. My father bought out mansions and estates in Palm Beach and I suspect that is where he got it. I have searched the whole internet for the pattern and only found it on Replacements.com as reg25 and only one dish was available. I would like to know more about this set. It is really beautiful and has gold around the edges and on the handles and knobs. There is a floral design with yellow under it around the circumference of all the pieces. I have pictures of it and would put them on this site if the option was available. do you think this is part of the Hull Pottery Co. mentioned in the previous inquiries?